The Foundation, star of Fashion Revolution Day and The Sustainable Sunday organized this weekend in Barcelona at the hands of Barcelona Sustainable Fashion. 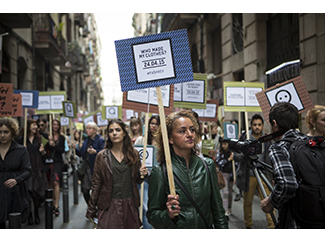 Over 200 people attended the event held last Friday in Barcelona for the Fashion Revolution Day. 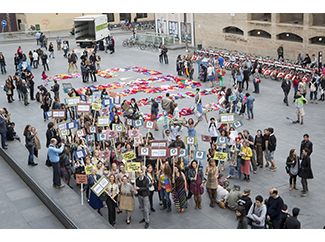 Sustainable Human joined Barcelona Fashion in organizing an event in Barcelona, ? ?coinciding with the day. 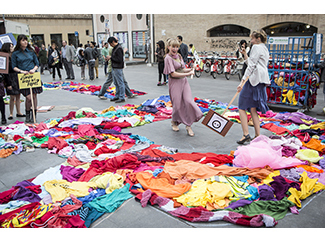 It was a performance at the Plaça dels Angels, opposite the Barcelona Museum of Contemporary Art MACBA, with which I wanted to show the amount of clothes we throw away each year. The action included a large installation composed of 400 kilos of clothes, which were formed on the floor lyrics FRD (Fashion Revolution Day). These 400 kilos of textiles used came from our plant classification of L'Ametlla del Vallès. Humana joined this event as part of its ongoing campaign to raise awareness of the importance of promoting reuse and sustainable fashion, as an alternative to Fast Fashion. The most sustainable garment is already produced, so second hand fashion fits perfectly into this philosophy of sustainability. On the other hand, Sunday 26 participated in the so-called The Sustainble Sunday, at the Center of Contemporary Culture of Barcelona CCCB. This event is part of the Sustainable Brands Barcelona and came to share a day with citizens through activities around sustainability. It included a special section dedicated to sustainable fashion. Humana speaker at the so-called PechaKucha: The originality of this format is that each speaker has to present his subject line using 20 slides, each of which is only shown for 20 seconds. Together with Maria Fernandez Humana intervened Mar Rocabert of Cudcecol, Sonia Flotats of soGoodsoCute, Valentina Thorner, Project 333, Vanessa Facho, a lawyer specializing in Law of Fashion, and Santi Majorca, Organic Cotton Colours.